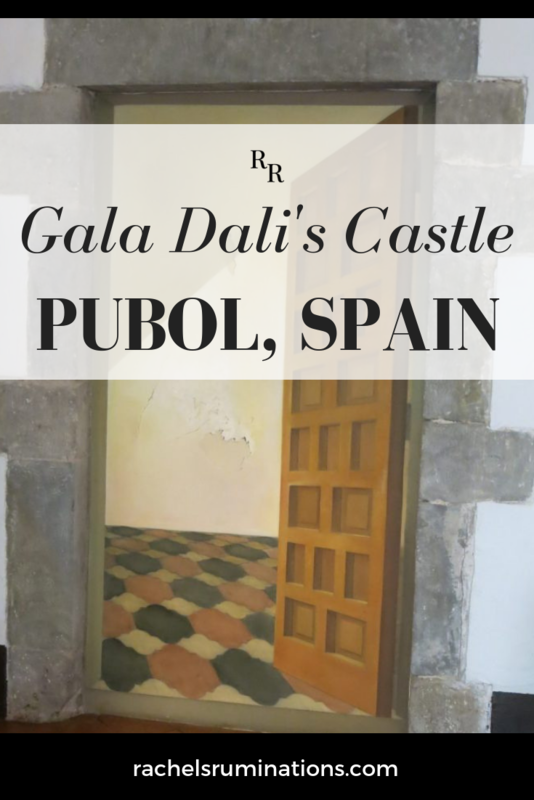 If you like Salvador Dalí’s art—even if you’re not such a fan of his work—the Gala Dali Castle in Púbol, Spain, is something you should not miss. 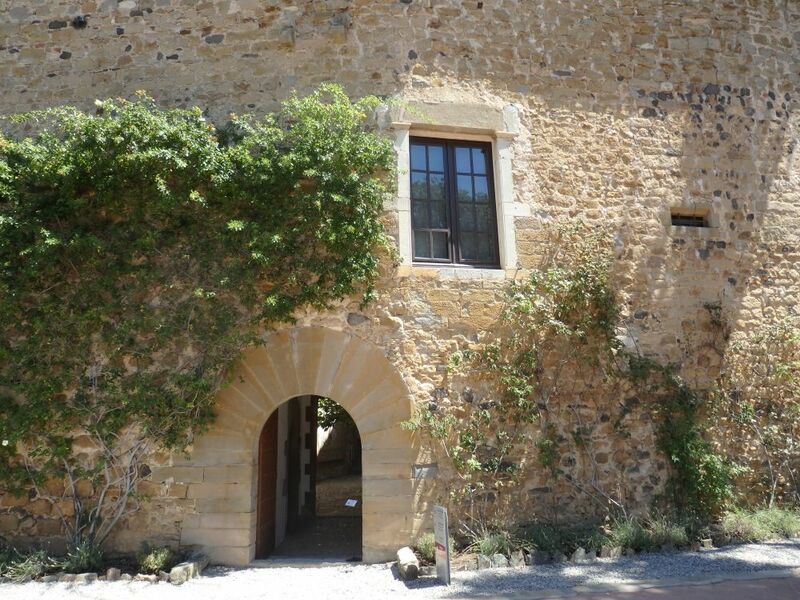 The unassuming entrance to Gala Dali Castle. This is not a Dalí museum. Dalí bought the building, a medieval castle, as a gift for his wife and muse, Elena Ivanovna Diakonova, who was called simply Gala. I am extremely grateful to the Costa Brava Tourist Board and the Consell Comarcal Baix Emporda for including me in a “Discover the Medieval Coast” tour, which included the Gala Dalí Castle. While I received admission and the tour for free, all opinions are my own. What makes it special, though, is that he didn’t just buy it and hand it over to her. Instead, he had it renovated to his instructions and decorated it himself: an entire Daliesque house! It’s meant to be a museum about Gala and her life and death. In reality, though, it’s a museum about Gala and Dalí’s relationship. Gala was first married to Paul Éluard, also a surrealist artist, and they had a daughter, whom she disliked and neglected. Gala and Dalí met when she was visiting Dalí with Éluard. When their visit was over, Éluard left and she stayed. Dalí was 10 years younger than Gala. He bought her a castle to live in. In other words, despite their marriage, they didn’t live together. In fact, she required him to write to her to receive permission to visit. She lived in the castle in the 1970’s. Apparently, she entertained a series of young lovers there as well, including her ex-husband. As medieval castles go, this is a pretty modest one. Stone walls, a very small courtyard, but not the kind you’d picture as a fortification. It’s more of a stately home than a castle. What’s special about it is Dalí’s interior design. For example, the throne room. 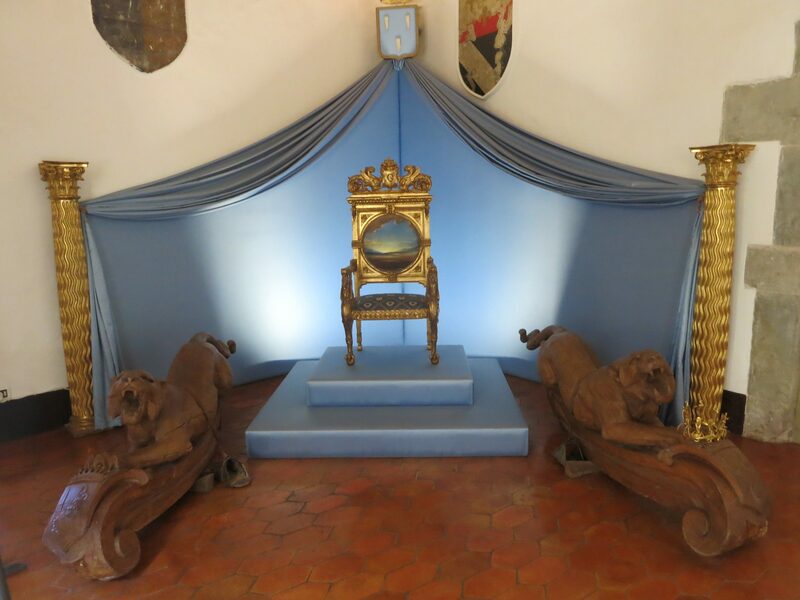 I suppose in Dalí’s mind, any good castle needs a throne. According to our excellent tour guide, Nik Duserm (whom I recommend unreservedly as a truly gifted storyteller), it was only ever used once—by Dalí, not Gala—for a photo shoot. 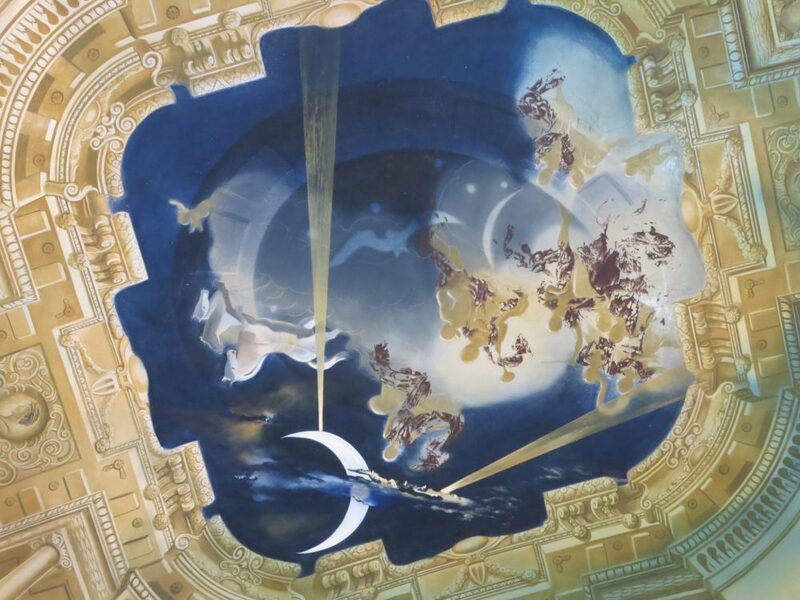 The ceiling was also his creation, echoing historical styles but with a surrealistic touch. Notice that he didn’t just assemble items from other makers for the throne or any of the interior décor. Besides the painting and sculpture he did for the castle, he designed much of the furniture himself too. For example, the living room, next to the throne room, has a glass-topped coffee table. 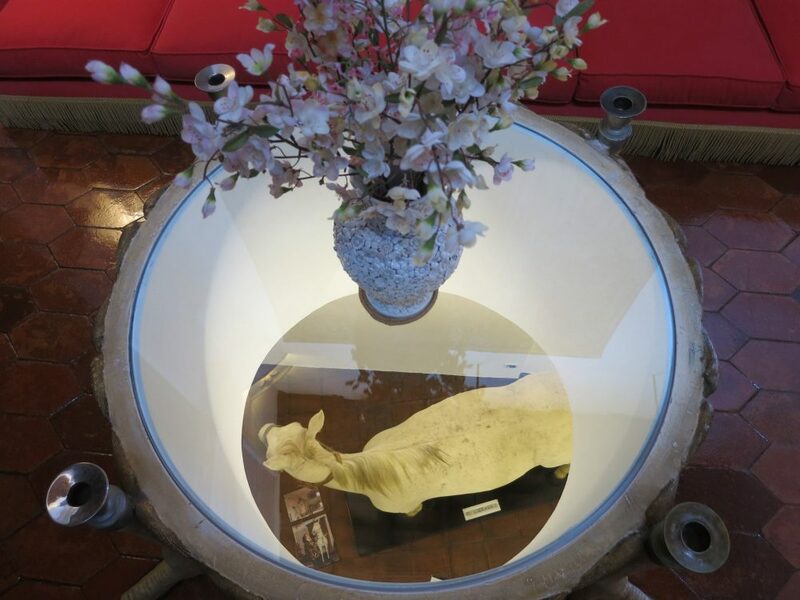 It seems ordinary at first, until you look down: a hole in the floor reveals a horse … an entire stuffed horse, which, apparently, Dali received as a gift. The view down through the table to the floor below. 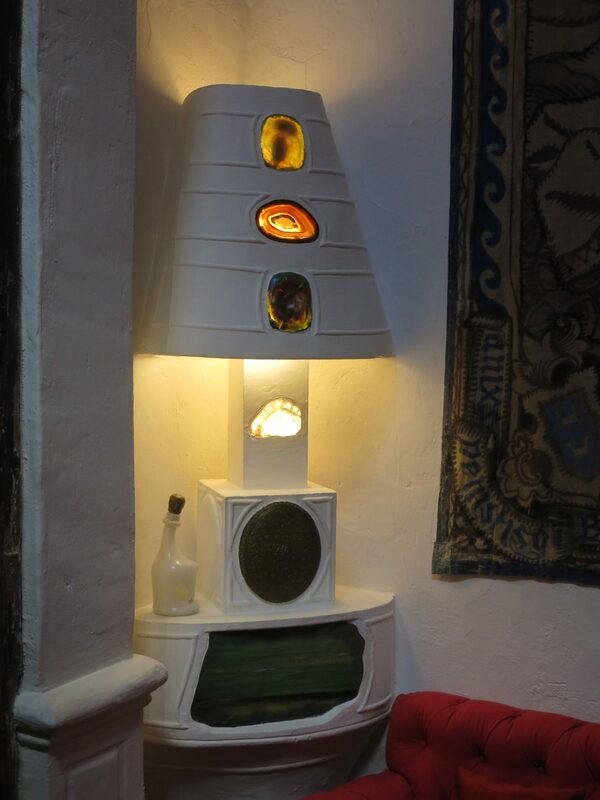 And the lamp next to the sofa isn’t just an ordinary lamp. Many rooms include references to medieval themes, in keeping with the history of the castle, but always with a surrealistic twist. He created several coats of arms that are all plays on the coat of arms of the original family who lived in the castle. 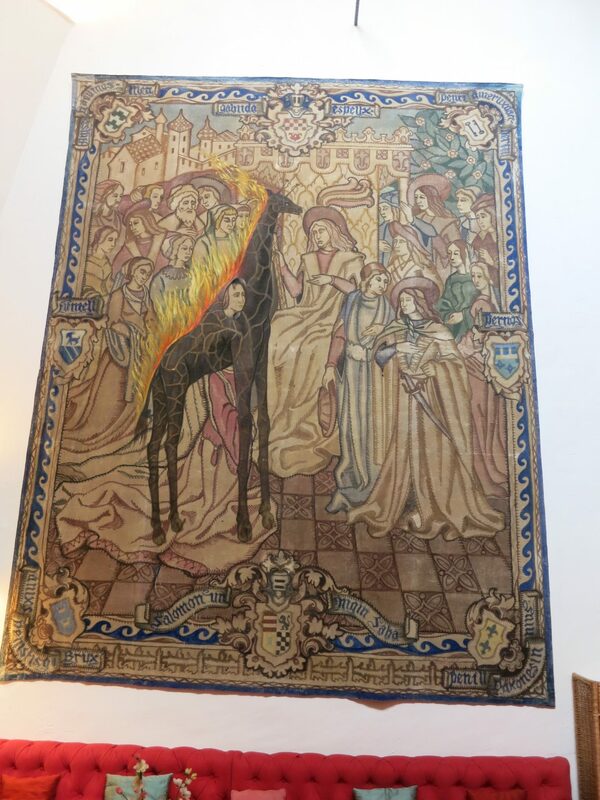 This painting of a tapestry is just one of many examples of how he referenced the age of the castle (medieval). The bathroom I found rather attractive, and less disturbing than some of the other rooms. It was converted from an old kitchen. 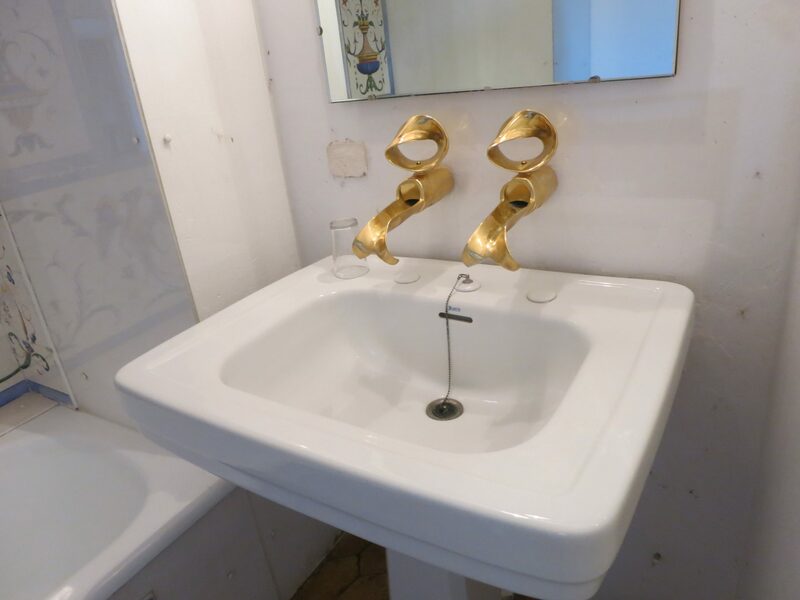 Dali designed these bathroom fixtures. Not one for half measures, Dalí didn’t stop with the interior of the castle. He added his special touch to the garden as well. The most alarming items are the monsters: huge statues that seem to be elephants, more or less, but have the legs of insects. Very creepy when you round a corner of the shrubbery and come upon one. 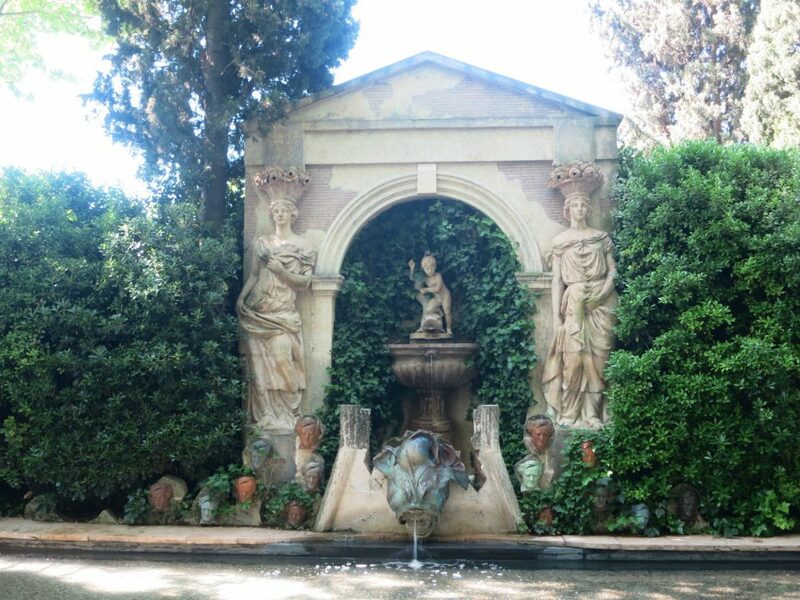 The fountain that forms the centerpiece of the garden seems classical at first glance, but when you look closer, you notice the heads on either side down near the ground. They’re Wagner: all of them. Again, classical references, but then … Wagner. This museum makes up one point of a “Dalí triangle” that Dalí admirers visit. The Dalí Theatre-Museum in Figueres was designed by Dalí himself and is filled with his works. It also hosts a gallery of Dalí-designed jewelry. 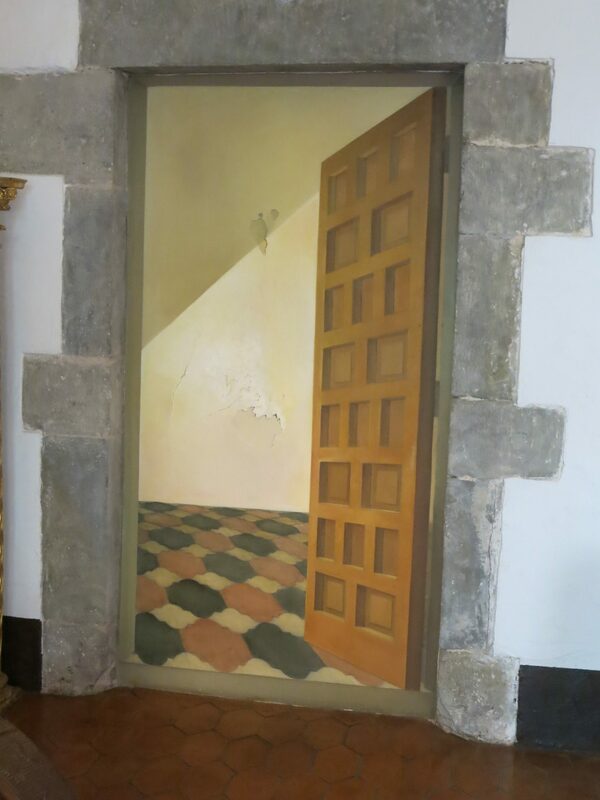 The third point in the triangle is the Dalí house in Portlligat, where he lived and worked and which he designed and decorated himself. Both the Castle and the Theatre-Museum were excellent. I assume that the Dalí house is just as worthwhile. Don’t try to see all three in one day, however. I don’t know about the house, but the castle will take a couple of hours to see properly and the museum in Figueres will take at least three—and that’s not including the time it takes waiting in line for a ticket to the museum if you don’t book ahead! Plan at least two days: three if you don’t want to rush or overdose on surrealism! How to get there: The Castle is on Gala Dali Square in Púbol-la Pera. The village is about a half hour by car from Girona, two hours from Barcelona and an hour and a half from Perpignan, France. You can take bus #11 from the central bus station in Girona, get off in La Pera, Gasolinera, and walk about 1.5 km from there. They also have open nights from 20-22:00 between July 28 and September 1, but only with a guided tour. Prices: Without a guide, adult tickets cost €8. If you want an English-speaking guide (or French, Spanish or Catalan), make sure to book in advance, and it will cost €10. Please share this post in whatever social media you like! 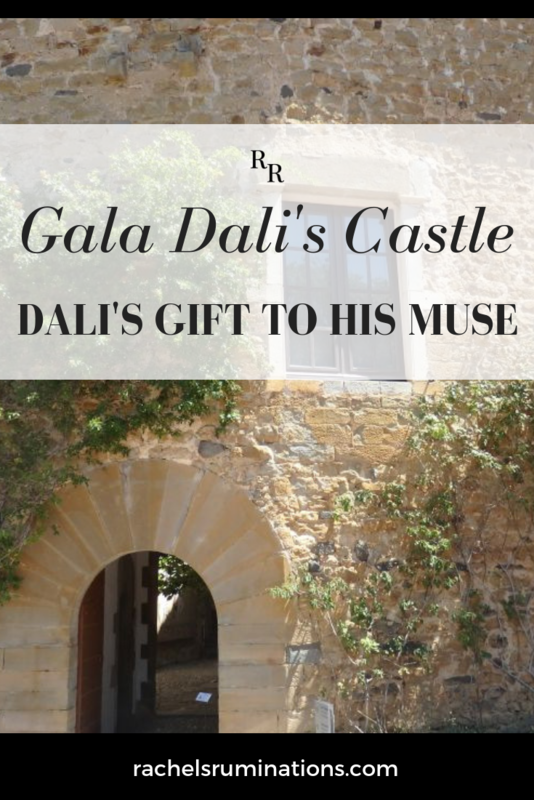 Gala Dali Castle is supposed to be about Gala Dali, but it’s really about her relationship with Salvador Dali! 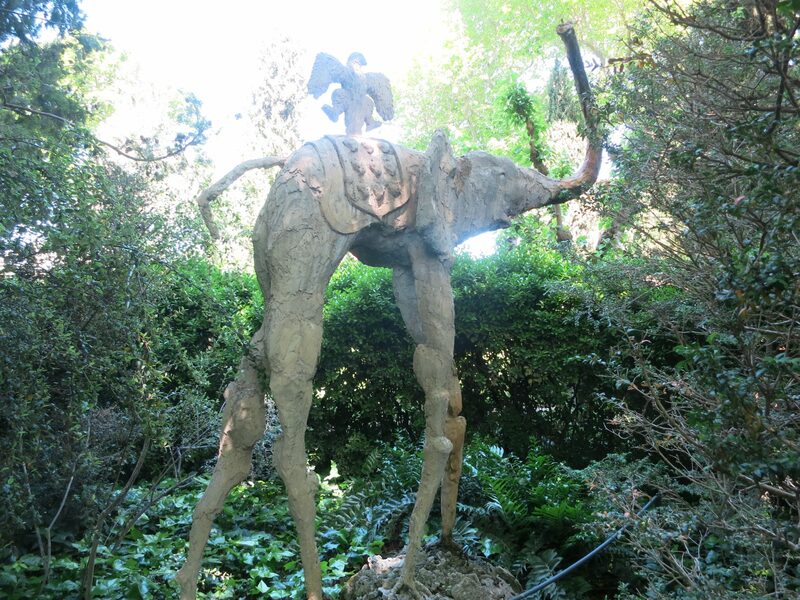 tamar and i visited the other two dali museums in the trilogy, during our honeymoon. Loved the EXPERIENCE of those visits. That’s a good way to phrase it: it’s an experience! You walk into each room not knowing what strangeness you’ll come upon next! It was disturbing! definitely a visit that stayed with me long after I left. perhaps that was the point. Dali never created anything you could dismiss easily from the mind. I know what you mean! Yet it makes me want to visit the other two! Elena (Gala) sounds like she played the field.Gorgeous pieces and scenery, though. Much of Dali’s work is too disturbing for my taste, but I would love to visit Gala’s castle in Púbol, Spain. I especially like his whimsical surprises such as the horse beneath the coffee table and the trompe l’oeil door. Yes, whimsical is a good word for it. Except for the monsters in the garden, most of it seemed pretty light-hearted to me. He wanted to make her happy, after all! Not having …Dali’d…on my trips to Spain,you remind me it’s time to return. Clearly being Dali’s wife/muse was a mixed blessing. Ha ha! Dali’d! I wish I’d thought of that! LOL! 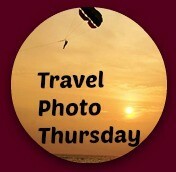 I heard about the Dali Castle from another blogger Rachel so you’re in good company. Sadly, I am ashamed to say that I haven’t yet visited the Dali exhibition in Berlin. I’m more an old art sort of person although I surprisingly seem to find myself at “new” galleries and exhibitions quite a lot LOL! Go anyway! If you like older art, you could easily keep yourself interested by finding the older references in his work!